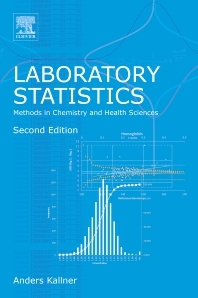 Laboratory Statistics: Methods in Chemistry and Health Science, Second Edition, presents common strategies for comparing and evaluating numerical laboratory data. In particular, the text deals with the type of data and problems that laboratory scientists and students in analytical chemistry, clinical chemistry, epidemiology, and clinical research face on a daily basis. This book takes the mystery out of statistics and provides simple, hands-on instructions in the format of everyday formulas. Spreadsheet shortcuts and functions are included, along with many simple worked examples. This book is a must-have guide to applied statistics in the lab that will result in improved experimental design and analysis. This thoroughly revised second edition includes several new sections, more examples, and all formulas in Excel code. Dr. Kallner studied general chemistry at the University of Stockholm and organic chemistry at the International Union of Pure and Applied Chemistry (IUPAC) Elections Royal Institute of Technology in Stockholm before graduating with a PhD in biochemistry from the Karolinska Institute in 1967. He later earned his MD at the same university and became Associate Professor of Clinical Chemistry at the Karolinska Institute. He has held positions in county, regional, and university hospitals. Although he retired from Karolinska University Hospital in 2005, Dr. Kallner retains professional assignments in the laboratory and international organizations. He has given more than 250 invited lectures and has contributed to more than 180 publications. Dr. Kallner has held numerous memberships and leadership roles on numerous international committees, including the International Organization for Standardization (ISO), the International Federation of Clinical Chemistry and Laboratory Medicine (IFCC), and the IUPAC. Dr. Kallner has participated in the development of several CLSI Evaluation Protocols, and is currently the chair holder of the Subcommittee on Expression of Measurement Uncertainty in Laboratory Medicine (C51) and an active member of the CLSI Area Committee on Evaluation Protocols. He has chaired and participated in the development of a standard in metrology in ISO, CEN, and CLSI. Dr. Kallner’s scientific work has spanned a wide field ranging from organic synthesis and metabolism of cholesterol to epidemiological and metabolic studies of vitamin D. An interest in quality management and development of routines for quality assessment in the laboratory required studies in programming and statistics. Eventually, Dr. Kallner recognized the need for a compendium of useful statistical procedures and formulas that could easily be used in programming and understanding of statistical procedure.